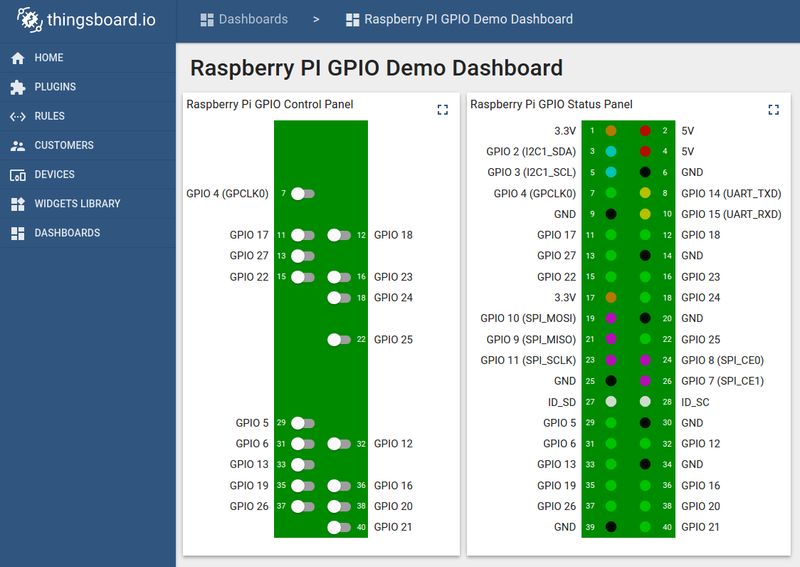 This sample application will allow you to control GPIO of your Raspberry Pi device using Thingsboard web UI. We will observe GPIO control using Led connected to one of the pins. The purpose of this application is to demonstrate Thingsboard RPC capabilities. Raspberry Pi will use simple application written in Python that will connect to Thingsboard server via MQTT and listen to RPC commands. Current GPIO state and GPIO control widget is visualized using built-in customizable dashboard. Since our application will allow to control state of all available GPIO pins, we recommend to attach some LEDs to those pins for visibility. You can use this basic instruction or another one to wire some LEDs.